Hong Kong citizens believe there is no excuse for the violence meted out by the Hong Kong police during the Umbrella protests, no matter how pressured and overworked the police may be. Police have received more than 1,700 complaints relating to the Umbrella protests since the movement started on Sept. 28. Most of these complaints are about assaults, neglect of duty, and misconduct by the police force. Meanwhile, a Dec. 9 Hong Kong University survey found that police popularity was only 29 percent, an all-time low. The police are aware of the criticisms and the poor public perception. On Tuesday, Nov. 9, assistant police commissioner Cheung Tak-keung says that police have “demonstrated utmost tolerance and restraint” in handling the “illegal” Umbrella Movement street occupations because they don’t want to see the public, “particularly students,” get injured in massive scuffles. Cheung also says that police will only use a “minimum level of force” against “radicals and troublemakers” in the protester crowd. But not everyone agrees that the police showed “tolerance and restraint” or used “minimal force” in past confrontations with pro-democracy demonstrators. 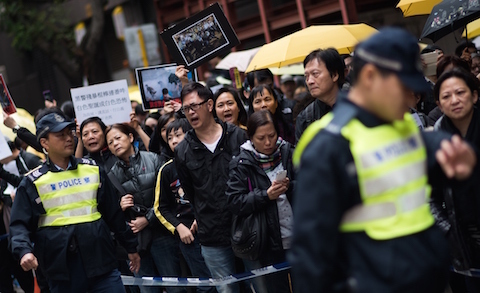 On Dec. 7, about 2,000 people from parents, social workers, and women’s groups carried out a “Parents Against Police Violence” march to police headquarters in Wan Chai. Waving photos of police lashing out at students and banners with slogans like “Do not let our children live in fear of intimidation” and “Dad and Mum are standing out now,” the marchers condemned the police for causing unnecessary and excessive violence at Lung Wo Road and in Mong Kok over the last two weeks. The “Umbrella Parents” called on the Hong Kong government to accept responsibility for police brutality, establish an independent committee to investigate police conduct and listen to Hong Kong citizens’ appeal for democracy. Earlier, the Hong Kong Journalists Association condemned the police for violating the “media’s right to report” after two press members were assaulted and arrested by the police while covering the Mong Kok clearing. 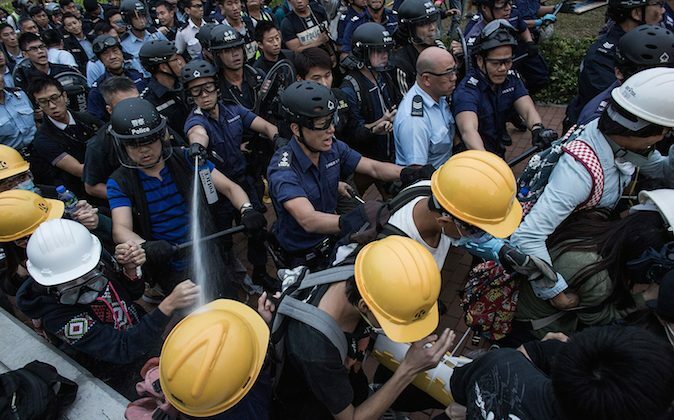 This article documents recent police action against the press and protesters that have outraged Hongkongers, and also seeks to provide some perspective on the Hong Kong police. Naysayers who predict that the Occupy movement will adversely impact Hong Kong's economy have it wrong for the first month of protests. For the first time in over two months of Umbrella protests, there's a sense that the end is near. HONG KONG—Police warned Hong Kong pro-democracy activists that they have until Thursday to leave a sprawling protest camp in the Admiralty district.